PetzA is an add-on for Petz 2, 3, 4, 5 and Babyz that gives you tons of cool new features and even fixes bugs in the game. PetzA appears as a new menu item at the top of your Petz or Babyz game. Babyz and Petz - take out an unlimited number of Petz and Babyz at once! Just keep clicking the "Pick a pet" button to bring out more. Instant mating of petz, have your babies grow up instantly! Stop your Babyz from soiling their diapers! Brainsliders for your petz/babyz - control their age, fatness, etc. If have a version which is slightly different than what is required (Eg. you have the Petz program from the Catz CD, but PetzA requires the Petz program from the Dogz CD), then PetzA will automatically download and install the new version for you. Please note! PetzA does not support non-English versions of Petz 5 or Petz 4. Allowing PetzA to auto-update these versions during install will stop them from working. To repair them, you can restore the backup that PetzA makes of the Petz exe. View a tutorial here. Already convinced? Head over to the download page. 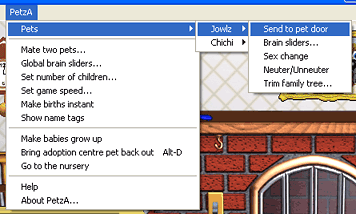 In some games, you may find that the game will crash if you're taking snapshots and choose "Take other petz/babyz photo" with more than 4 petz/babyz in the scene. Remember that the brain-sliders are dangerous to use for "growing-up" only some of a litter of babies who are still part of their mother. Use the sliders on babies at your own risk; if you corrupt the mother's file and lose the babies, nobody can fix it. If you click on the "bring out" name of an already-out pet, the game will crash. Remember that this is still in development, treat it as you would any beta-test software. Use at your own risk and remember to always, always, ALWAYS store backup copies of your precious files somewhere safe. I repeat -- make sure you back up precious .pet files and .baby files. Unfortunately, PetzA cannot support Catz 1, Dogz 1 or Oddballz, as these programs are in a different, incompatible format. This version removes the screen resolution check on Petz 5, allowing Petz to run on smaller screens, like laptops. This version prevents crashes caused by making your pets too young (Below 6), and lets you stop Babyz from being able to soil their diapers.